When I was growing up, my mom would make us peach cakes with whipped cream for our birthdays. They were my favorite cakes (that weren’t made out of ice cream). My brothers and I would wait patiently to lick the beaters from the whipped cream and steal slices of when she wasn’t looking. I think that was always the best part. I recently made this cake for J’s birthday. I had some really great fresh peaches to use…and I had some that were just okay. I decided to chopped up the sub par peaches and heat them with a bit of sugar, water and peach schnapps. I used the puree between the layers of the cake and on top under the whipped cream. It really bumped up the peach flavor, and was pretty good on its own. 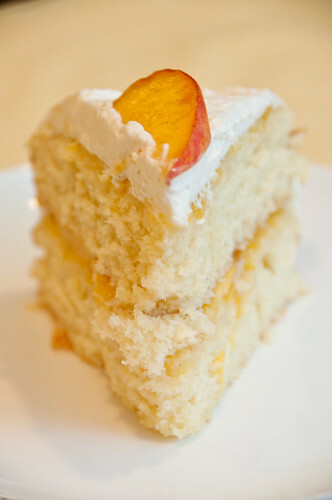 The yellow cake is sturdy enough to not get mushy with the peach puree and fresh peach slices. I covered it with a thin layer of whipped cream. I really liked how you can see the outlines of each layer. I only had a few minutes to chill this cake before we served it, but it held together really nicely. Chop three of the peaches and combine with water and sugar over low heat. Bring to a simmer and blend until smooth with an immersion blender, stir in the schnapps and allow to cool slightly. Slice the very top off each cake leaving an even and flat layer. Spoon a generous amount of the mixture over each cake. The peach puree will soak into the cake. Slice the remaining three peaches and place a layer on top of one of the cakes. Put the other layer on top and chill while the whipped cream is prepared. Whip the cream, confectioners sugar and vanilla. 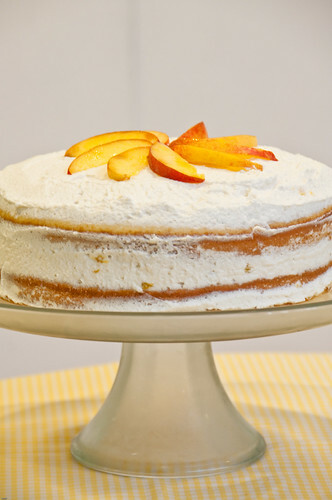 Top the cake with an even layer and use reserved peaches for the top of the cake. Keep the cake in the refrigerated prior to serving. O-M-G, this looks so good!!!! I’m bookmarking this! What a beautiful cake! Delicious flavors! What a beautiful cake!!! 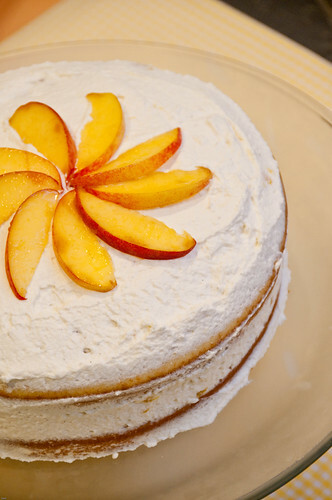 I love peaches and cream but never have tried in cake form! yum! This cake was absolutely delicious! The cake was dense enough to give the cake a substantial feel and a great balance for the absolutely yummy puree. As pretty as it is, it tasted even better! Memoria, Rosa and Jen- I am so glad it looks good to you! This is so beautiful and looks fantastic. I have a sister who LOVES peach anything…might just have to give this a try. what a gorgeous and fluffy cake! the texture alone of that slice has triggered my saliva glands like nothing else has done all week, and that’s in 2D! very excellent work, jillian, and magnificent blog all-around! Oh wow! This cake looks heavenly! Right up my alley, since I’m addicted to peaches!! Oh yeah … I want some of that! This looks light and angelic! Peaches are so good right now and this sounds like the perfect way to use them. Such a classic flavor pairing. Nice use of the schnapps. I’m thinking brushing any plain cake with a simple syrup + peach schnapps would be so good. The best form a flattery is to be copied!! You made it even better. Hmm Tangled Noodle, I can’t think of a replacement for the peach schnapps, but you could cook down an extra portion of the puree to intensify the flavor. The fragrance from the schnapps will be missing but it will be close. I made this cake yesterday for a cook-out, after reading the reviews I was nervous about how it would turn out, I followed the directions to a “T” and also used whipped cream in between the 2 cakes and chilled the cake really well before serving. I think the cake flour is the key and with baking you have to measure the ingredients precisly. It was beautiful and tasted almost like a peach shortcake. I will definitely make it again but I think I will boil down all the peaches except for the decoration on top. I might even branch out and use apricots the next time! Cristina- I think most of the reviews on about.com are related to measuring incorrectly. So glad you liked this version! Jillian- yes the basic yellow cake mix are the reviews that are not too good. Not for your cake. The smell of the peaches simmering was incedible!